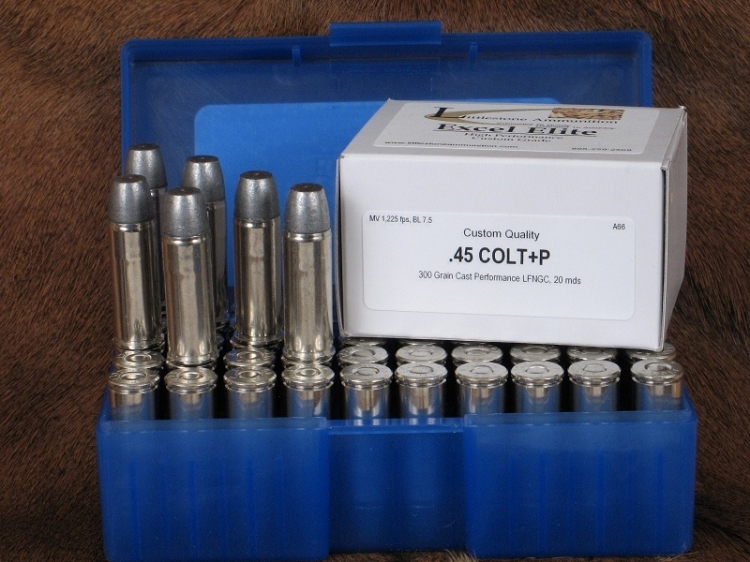 A generic photo of 20- and 50-round boxes of one of Littlestone Ammunition's loading of the .45 Colt +P cartridge with 300-grain Cast Performance Long Flat Nose bullets. Hover cursor or click on photo for close-up view. Firearm not included. Deliver bone crushing, deeply penetrating power on large game from your .45 Colt +P with Littlestone Ammunition's Custom-Quality Excel Elite loading of the Cast Performance Long Flat Nose Gas Checked lead bullet. Delivering more than 1,000 foot pounds of energy with a muzzle velocity of 1,250 fps, this 20 rounds is sure to drop 'em where you want. This ammunition features Federal Gold Medal MATCH primers for accuracy and Remington nickel-plated brass for a lifetime of non-corrosive use. It is designed to provide the handgun hunter the maximum accuracy and terminal performance. Feature 3: MV / Energy / Barrel: 1,250 fps / 1,041 ft lbs / 7.5"